Reading the Bible and other inspirational words start my day off with the right frame of mind/heart/spirit. Devotionals deepen my prayers and give me new perspectives. Often I hear God through other writer’s insights and words. Devotions breathe new life into my tired soul. They nourish me, strengthen me, and shape my spirit. Devotions realign my thoughts with God’s thoughts; God’s vision unclouds my point of view. Time in fellowship with God become a sanctuary of worship and love. I hear God better when I quiet my noisy interior and enter his presence. Consistent connection with God is a joy and source of guidance and correction. The devil loves a dusty Bible, you know. Worshipping and being with God isn’t only a one hour on Sunday, but envelopes our every moment. Daily devotions help me praise God and worship him. Devotionals invite me into God’s word. I see once again my brokenness, my sin, my ego and am received by a loving, gracious Lord. I am far from perfect but I am a beloved child of God and God wants to spend time with me too. Several years ago, I published 40 Voices – a Lenten Devotional and have been asked multiple times when I was going to write devotions for the Advent season. Now I admit I am uncomfortable with book promotions but I did want to share an update. I am happy to announce the birth of a new book. 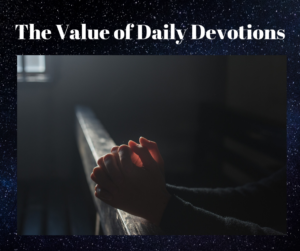 What is your favorite daily devotion?